A Quester's Journal: Hey Dad! 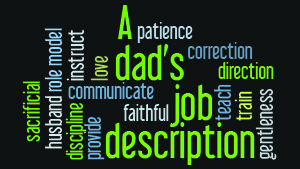 Many fathers have stretched the time they work from before and until after the sun makes its journey through the sky. Fathers who spend time with their children bring untold blessing into the lives of those youngsters. But, like mothers, there are benefits to the male brain that result from spending time with their kids. One research program studied marmoset monkeys and found that the male monkeys who were fathers (marmoset fathers help raise the babies) were faster and more accurate at finding containers with food in them. In human homes, the more time a father spends in the house, the less likely he is to be told, “It's behind the milk.” I have become so suspicious of the milk in our fridge that I have been known to check behind the milk before asking if anyone has seen my socks. In all seriousness, dads, we've got a lot to answer for. We shouldn't be grunting, “I brought you into this world and I'll take you out” unless we are willing to spend time loving and being loved by our children. Dad, your kids need you. They need you in their lives when they are living it – at home and engaged when they are awake and active. Dads, when we spend time with our kids we give them a good start in life. Your example as a father, a husband and grown man will help them become all they can be.